For quantitative determination of DNA. • Sensitive and accurate. Linear detection range 2 ng to 40 ng (100 - 2,000 ng/mL) calf thymus DNA in 96-well plate assay. • Simple and high-throughput. The "mix-and-read" procedure involves addition of a single working reagent and reading the fluorescence intensity. Can be readily automated as a high-throughput assay for thousands of samples per day. • Low interference. RNA, salt (up to 3M NaCl), detergent (< 0.01% SDS) and common DNA extraction buffer do not interfere in the assay. DNA quantitation is a common practice in molecular biology. Very often DNA is available in minute quantities and the traditional UV 260 nm absorbance method requires microgram quantities for reliable results. 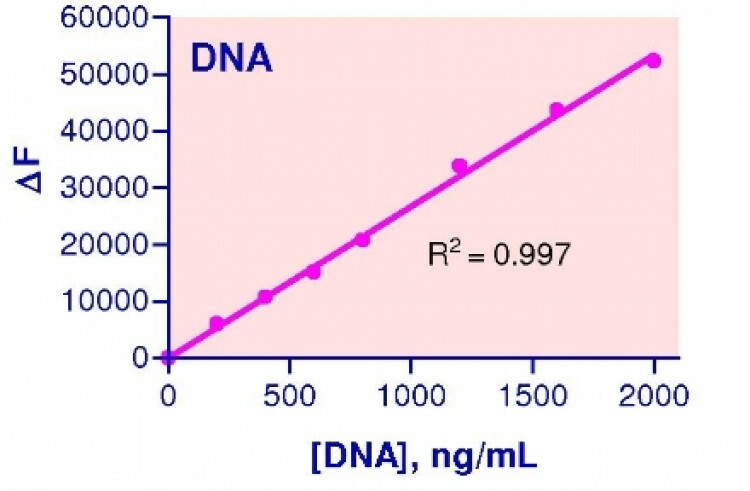 Accurate determination of DNA concentration, especially when DNA is present at low concentrations, is crucial for reproducible results in sequencing, cloning, transfection and DNA labeling. Simple, direct and automation-ready procedures for measuring DNA concentration are very desirable. BioAssay Systems’ QuantiFluo™ DNA assay kit is designed to accurately measure nanogram quantities of plasmid DNA, cDNA, DNA following polymerase chain reaction and DNA eluted from gels. The improved method utilizes Hoechst dye that binds specifically with double-stranded DNA. 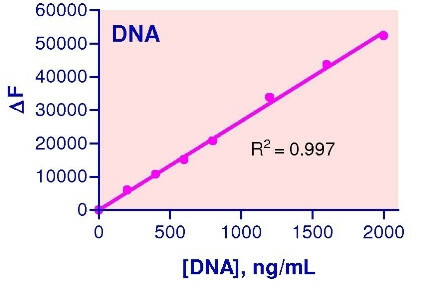 The fluorescence intensity, measured at λex/em = 350/450nm, is directly proportional to the DNA concentration in the sample. The optimized formulation substantially reduces interference by substances in the raw samples. Applications For quantitative determination of DNA. References Assay: DNA in Human cell line (Pubmed). 2. Lai, M et al (2007). 2007 AAPS Annual Meeting & Exposition. Development of an In-Vitro Screening Method to Determine Enzymatic Release Rates from a Homologous Series of Novel SN-38 Conjugates. Sonus Pharmaceuticals. Assay: DNA in Human cells, stem cells (Pubmed). 3. Bhavnani BR et al (2008). Structure activity relationships and differential interactions and functional activity of various equine estrogens mediated via estrogen receptors (ERs) ERalpha and ERbeta. Endocrinology. 149(10):4857-70. Assay: DNA in Rat microglial cells (Pubmed). 4. Mayer-Wagner S et al (2010). Membrane-based cultures generate scaffold-free neocartilage in vitro: influence of growth factors. Tissue Eng Part A. 16(2):513-21. Assay: DNA in Human stem cell (Pubmed). 5. Yasuda, N (2007). EFFECTS OF LONG-TERM STRENUOUS EXERCISE ON OXIDATIVE DNA DAMAGE AND PROTEINURIA IN HUMANS. Ph.D. Thesis. Assay: DNA in Rat primary glial culture (Pubmed). 1. Waheed MM et al (2011). Some Biochemical Characteristics and Preservation of Epididymal Camel Spermatozoa (Camelus dromedarius). Theriogenology 2011 Jul 13. Assay: DNA in Human cell line (Pubmed).